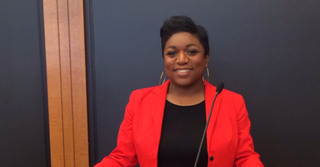 The White House announced Thursday that it has promoted Deesha Dyer to social secretary of the White House. Dyer will also serve as a special assistant to the president. Dyer is the second African-American woman to hold the post of social secretary. Dyer had previously served as deputy social secretary and, before that, amassed an impressive array of roles at the White House, beginning as an intern in the Scheduling Office at the age of 31. She climbed her way up the ladder, going on to become the associate director of scheduling correspondence, then hotel program director and then deputy social secretary. First lady Michelle Obama described how impressed she is with Dyer’s work and her commitment to developing initiatives that make the White House accessible for all kinds of Americans. Dyer, in the press statement, described how she’s looking forward to managing the goals of the social team at the White House. Dyer is a Philadelphia native who worked in corporate America and media for more than 10 years before going to the White House.